Want a little “lift” in your home? Paint is one of the easiest ways to make your home feel refreshed in the New Year. Wall color is the quickest and most simple way to transform a room. It is truly amazing what a little paint or wallpaper can do. Both are a great way to express your personality and design aesthetic. You can go bold or subtle, dark or light. New textures and colors will help you fall back in love with a room and create an exciting, dynamic space that makes you feel right at home. Selecting a paint color can sometimes seem like a daunting task. Which blue? 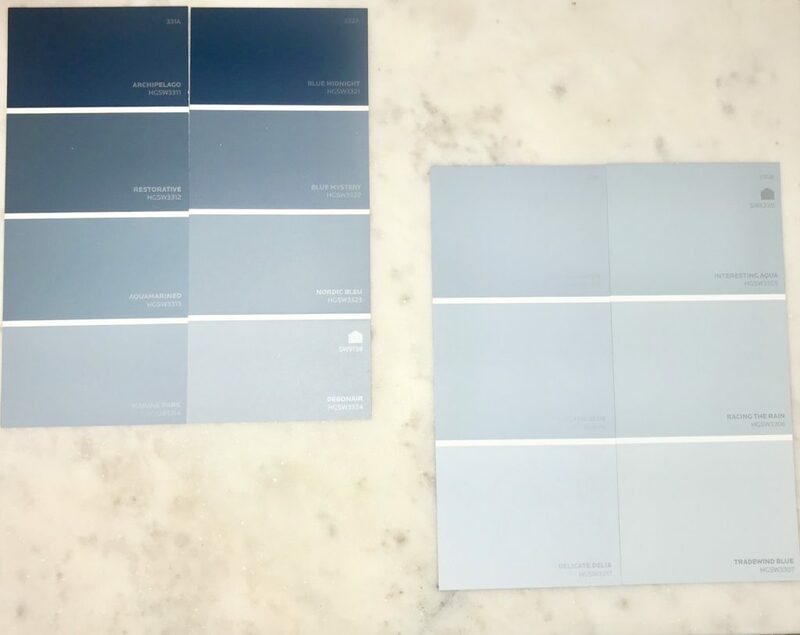 Which grey? How can there be so many versions of cream or coral?! Another consideration is lighting, both natural and installed light. And what time of day the light hits your room most intensely. Here at KF, we know a thing or two about selecting the perfect color. An expert on colors and hues, we turned to our EIC, Kathy Fielder for some advice on how to pick the perfect color and how she goes about making just the right selection in any space. Greys are one of our favorite neutrals. They are pretty and soft but go with anything! Go for undertone when looking for a grey. 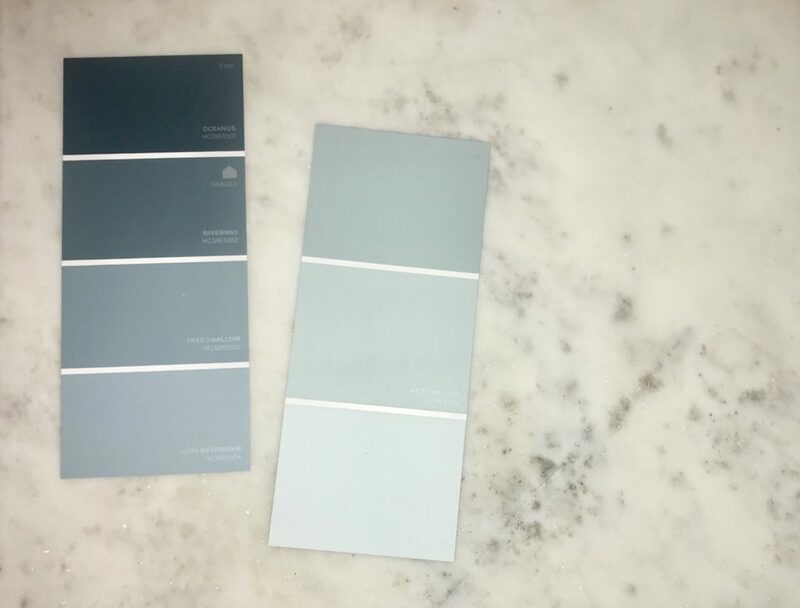 We are attracted to more blue, cool tones (think more on the softer, natural side), but if you want to incorporate grey with warm tones go for a more taupe or “greenish” tone in your grey selection. Something about a greenish-blue is so alluring and inviting. Maybe it’s because it reminds us of beach living. Whether you want a mintier color or a teal, this is one of the most perfect additions in kitchens and bathrooms to create your ultimate space. KF Tip ~ Use paint swatches to see what colors pair nicely with each other when trying to paint a room. 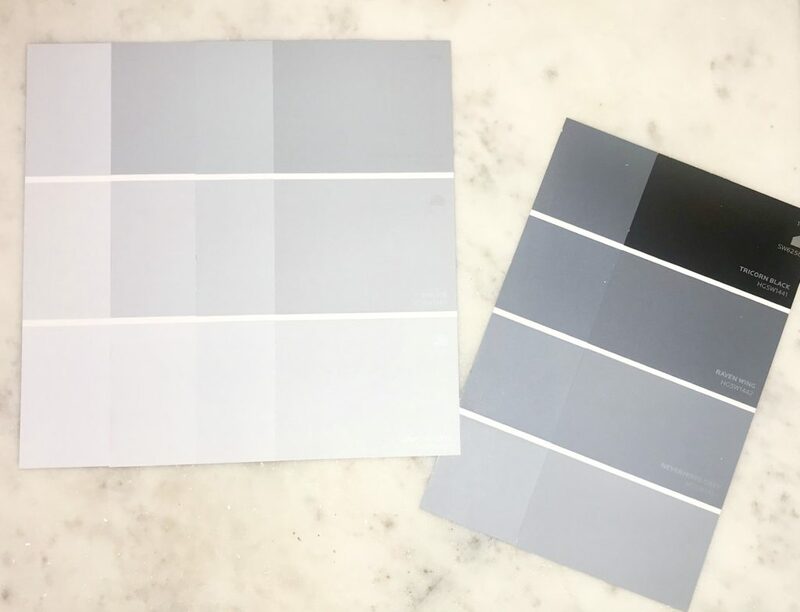 Shades on the same card will correspond from the lightest all the way to darkest, so when you compare similar cards you can wean out the weakest selection and look for the best one for your space. Grab corresponding, but different colors to put around the room so you can see how light affects them from morning to night, and what color variations produce the best result in your space. These shades of dusty periwinkle are so IN for 2019. 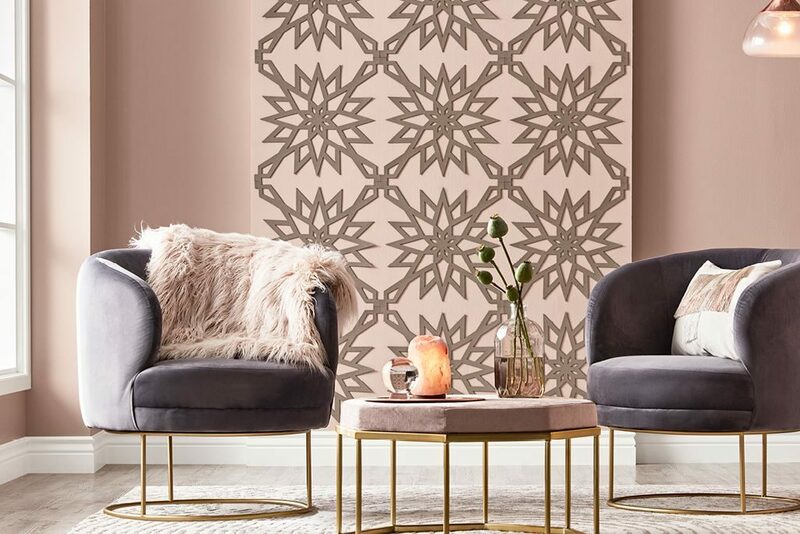 We’ve seen it in fashion for spring 2019, and it’s no different for interior decor. KF always says if you see it on the runway, then emulate it into your homes soon after because it’s whats going to be on-trend. 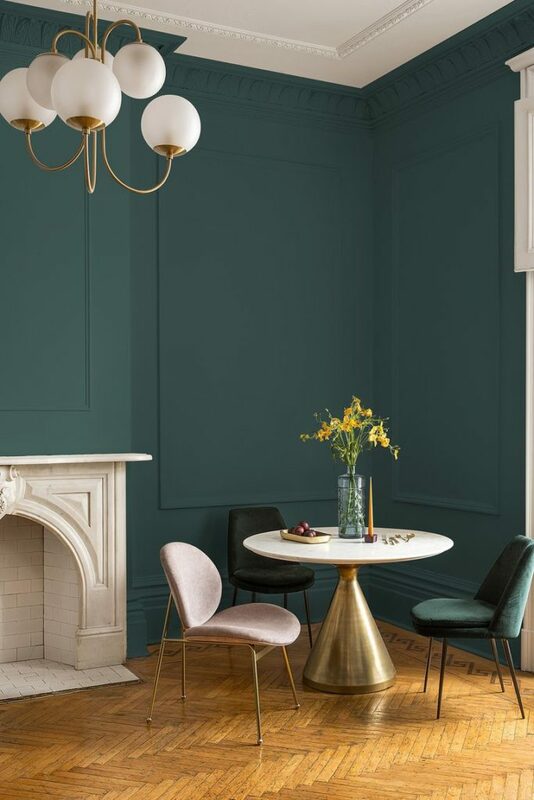 We adore this color to have some fun and to reimagine interior spaces for spring and summer 2019. Start the year off right with totally on trend colors that make a statement. A can of paint is the easiest way to update your space, and make it pop! Colors reminiscent of deep teals and forest greens are haute this year, but the true key is to modernize them. 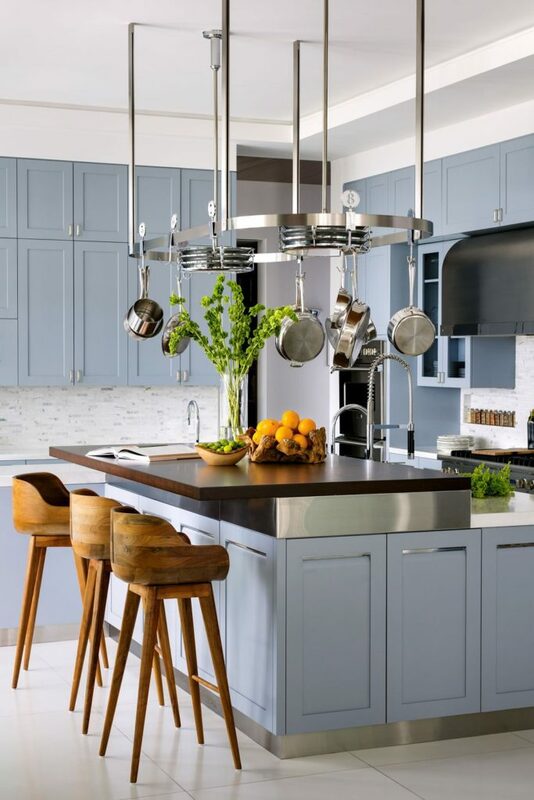 They are striking and the ultimate expression of modern, cool styling, with a nod to classic design, which means timeless..
Sherwin Williams is calling this hue the 2019 wall color of the year. We have seen western inspired looks both on and off the runway, and now we’re incorporating it into interior design! The idea is to bring a warm earthy outdoor shade indoors to make your decor pop. 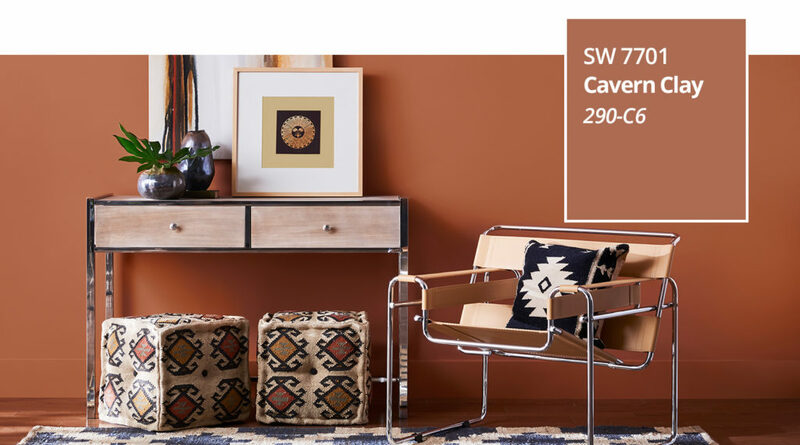 Livable western inspired looks that have a modern vibe are all the rage for interiors. Blues with a grey undertone are always beautiful and soothing. 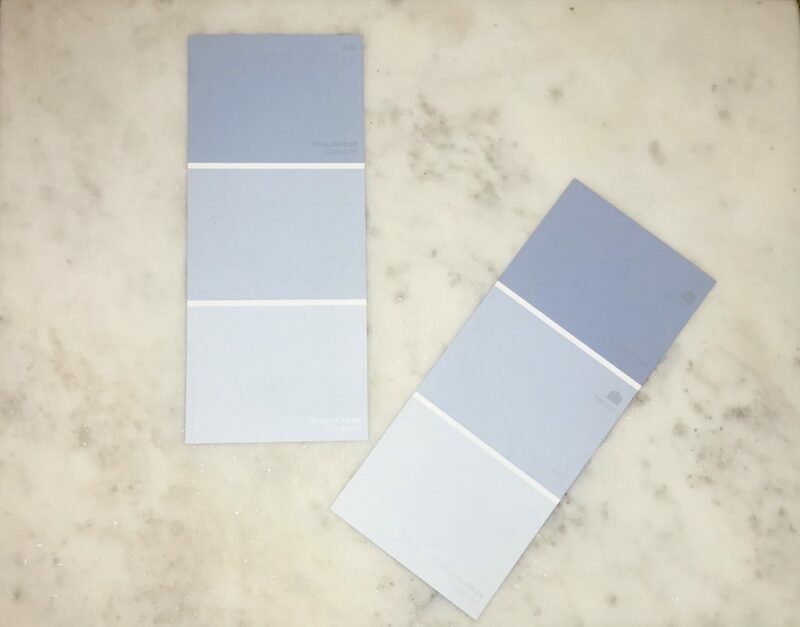 Whether it’s in a bathroom, bedroom, or kitchen, a blue with a bit of a grey undertone is just so inviting. Go deeper in places such as your powder room, and lighter in larger spaces where you’re covering more surface area with the paint. 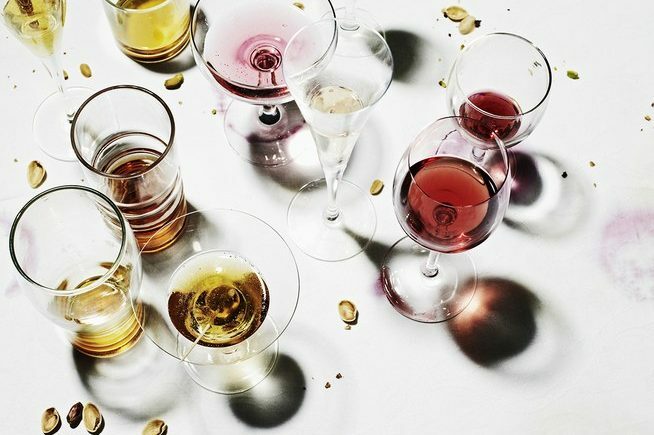 We’ve seen blush make a huge impact these past few seasons. Now take the trendy millennial pink, but make it more dusty and muted so that it is now a timeless neutral. Haute blush paired with ink or charcoal and brushed metallics is maybe one of the most divine combinations you can create in your interior spaces for max impact and total refinement. 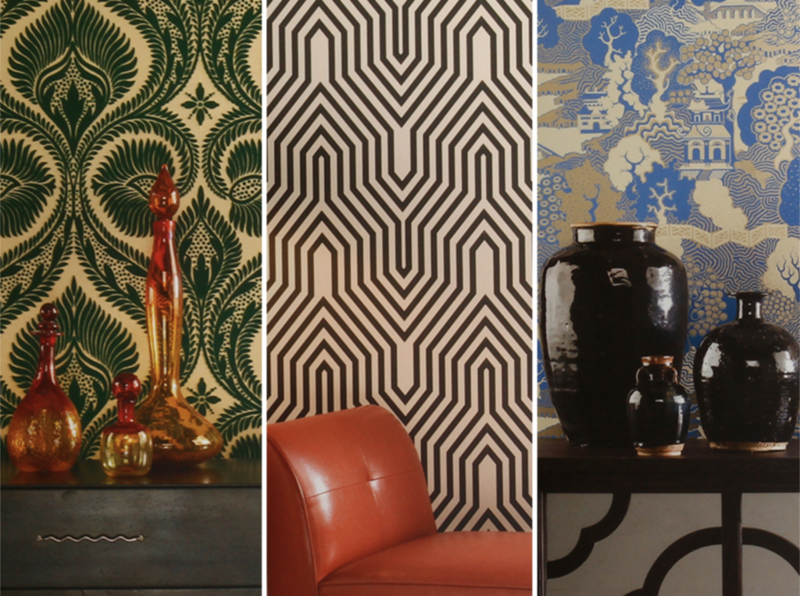 When choosing wallpaper keep your design aesthetic in mind. Don’t fall into the trap of picking one based off of another opinion or a popular trend. After all, it’s your space, you have to love it and live with it! Go for high quality paper that coordinates with what you already own. Take your space into consideration before you start looking. 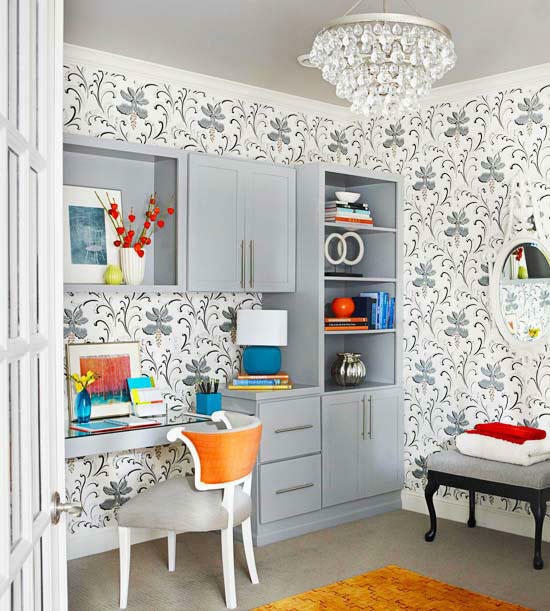 The size, shape, and lighting of a space will affect paint and wallpaper alike. Keep in mind light changes in a room throughout the day, hang up a large sample in an obvious place to see what it does with different forms of light and to get a feel for if you like it on your wall! KF Tip ~ Go the extra mile and hire the best pro you can find to install your paper. It’s worth the money and makes all the difference in the final outcome in your space. Torn on what to choose for your space? 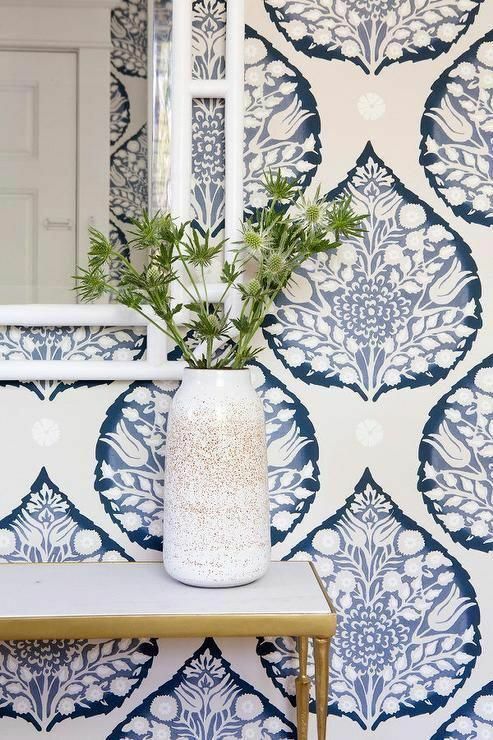 ~ See great tips about choosing the perfect wallpaper from Amara. 1. Calculate the wall space to be covered in square feet. Measure a wall from ceiling to floor and horizontally from corner to corner. Multiply those two figures. Repeat for remaining walls. Add the totals. 2. If you’re covering a ceiling, calculate the square footage by multiplying the width of the floor by the length. 3. Divide each figure by 25 — the average square footage in a standard single roll of wallpaper. 4. Subtract from the total one-half single roll for each window and door. The resulting figure is the final number of single rolls needed. Always round fractions to the next highest whole number. If your wallpaper comes in double rolls (most residential wallpapers do), divide this figure by 2. Check out 10 Things to Know When Hanging Wallpaper from DIYNetwork. Also see HGTV’s step by step to applying wallpaper. 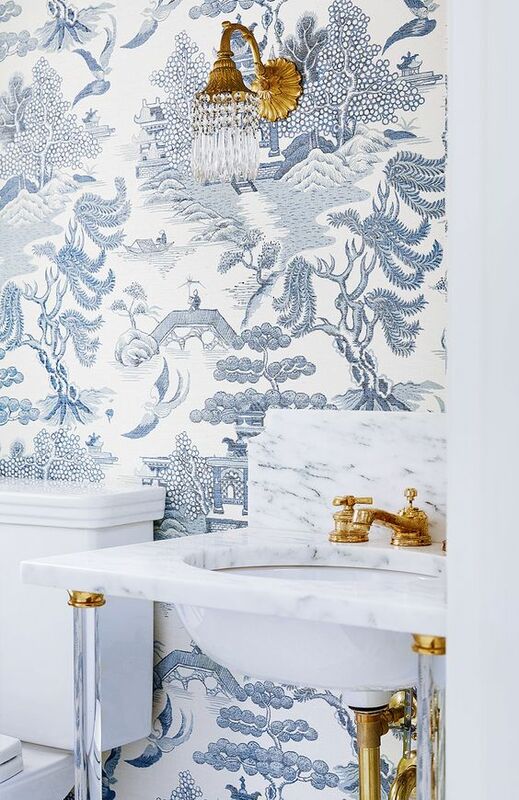 Powder rooms are such a fun and fabulous thing to decorate. Typically a small space that surprisingly leaves a lot of room for so many different options. 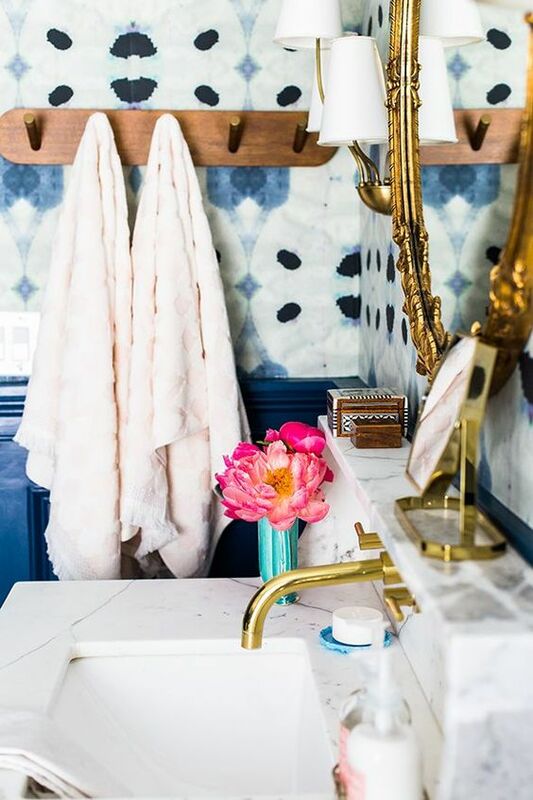 If you don’t want to take many design risks, but you want a statement space, your powder room is the place to do it. What’s the trendiest thing in powder baths? Statement wallpaper. Go bold. Be creative. Express yourself and make something that makes you smile every time you walk into the room. Why not? You will be so happy you took the risk. Want a little more inspo? 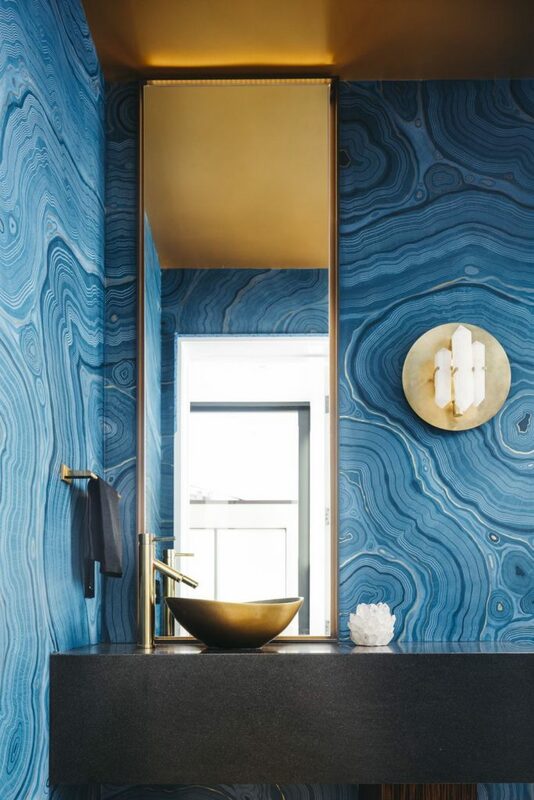 See 40 Stunning Powder Room Ideas from Elle Decor. 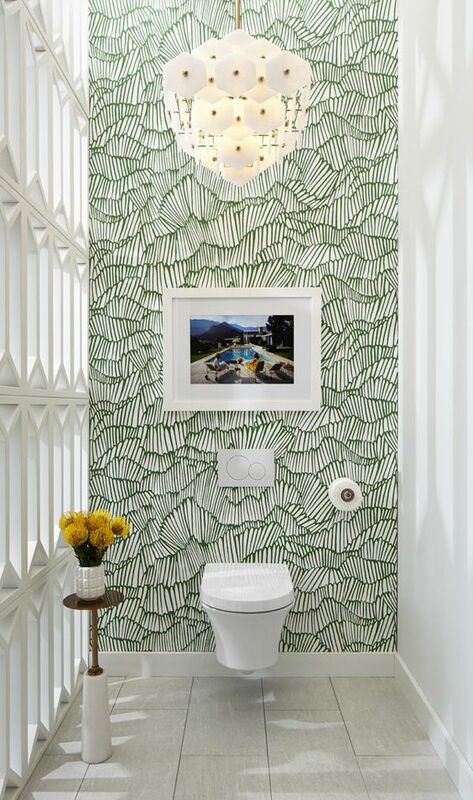 Also, check out 50 Picture Perfect Powder Rooms from Houzz!